The growth of various social media sites such as Facebook and the continued popularity of YouTube have resulted in revolutionary changes in the way video is captured and shared. Among the most popular video cameras on the market today is the GoPro series of cameras, which are used to record anything from birthday parties to short movies. However, GpPro is the video camera of choice to record action sports such as mountain biking, surfing, climbing, and skydiving. These cameras continue to advance both in capabilities as well as a continued reduction in size and weight. However, while the video capabilities of the GoPro series of cameras are excellent; their weakness has always been on the audio side, due to their small internal microphones. This weakness is easily overcome by using an external microphone to produce excellent audio to complement the outstanding image quality found to the GoPro series of digital video cameras. While there are a number of excellent microphones on the market, here is the best of the best! The Sony ECMCS3 is among the smallest and lightest of all of the microphones on the market and is also one of the least expensive. Weighing in at 12.0 grams and measuring 11.0mm x 32.0mm, the Sony ECMCS3 is designed to attach to the photographer clothes via a clip. This clip will allow the cord to rotate 360° without displacing the microphone, which makes the microphone perfect for filming the action from the videographer’s point of view (POV). Unlike other microphones, the ECMCS3 is omnidirectional, meaning that it gathers sound from all directions. Other features of the microphone include a frequency range of 50Hz to 15,000Hz, which is capable of producing excellent audio quality. Since it mounts to the clothing of the videographer, there is no shock mount, nor is there a windshield to reduce wind noise. Many will appreciate that there is no battery required for the microphone since it runs directly off of the GoPro camera’s battery. At a suggested retail price of $19.99, the Sony ECMCS3 is hard to beat! * Information from the Sony and various other websites, including pricing. One of the biggest names in external camera microphones is the Australian manufacturer Rode, who manufactures a number of excellent microphones including the “shotgun” style Rode VideoMicro, which features a light and compact build in a very affordable package. Featuring a frequency range of 100Hz to 20,000Hz the VideoMicro is a directional style microphone that needs to be pointed in the direction of the audio source to provide the best performance. The microphone features an aluminum body that is durable and light with the microphone weighing in at a mere 42 grams. In addition, the VideoMicro is quite small measuring 21.0mm x 21.0mm x 80.0mm. Check here for the latest prices and discounts! * Information from the Rode and various other websites, including pricing. Another great external microphone from Rode is the VideoMic Go, which is also a directional style microphone. With a frequency range of 100Hz to 16,000 Hz, the audio quality is quite good and is effective in not picking up background noise, including wind noise as well as a result of the supplied windshield cover. The Rode VideoMic Pro features a tough ABS plastic build and weighs in at 73 grams and measures 79.0mm x 73.00mm x 167.0mm, which is quite compact for this style of microphone. Other features of the “Go” include a shock mount, as well as the elimination of a battery for power. The Rode VideoMic Pro is known for its ease of operation, and Rode offers the best warranty program in the industry with the “Pro” featuring a warranty period of up to two years, which is also featured on the Rode VideoMicro. Anyone looking for microphone featuring excellent audio quality in a compact and light package should consider the Rode VideoMic Go. At a suggested retail price of $99.00 it is quite the value! Check out the latest prices and discounts. Another Rode microphone worth considering is the Rode VideoMic Pro, which is heavier, larger and more expensive than the “VideoMicro and VideoMic Go models, however, the “Pro” features enhanced professional-grade audio performance. The “Pro” features a frequency range of 40 Hz to 29,000Hz and is also a directional style microphone. The Rode VideoMic Pro is made of reinforced ABS plastic, which helps keep the weight down to 85 grams. In addition, despite being able to capture studio grade audio, the “Pro” is compact measuring 100.0mm x 75.0mm x 170.0mm. The “Pro” does require a battery, but due to the microphone’s efficiency is capable of recording approximately 70 hours of audio on a single 9v alkaline battery. The durability of the “Pro” allows Rode to offer a warranty that can be extended to 10 years, which is almost unheard of in the electronics industry. At a suggested retail price of $229.00 the Rode VideoMic Pro is quite the value for such an advanced microphone with a great warranty! The Sound Professionals SP-TFB-2 is an American manufactured binaural omnidirectional microphone that captures sound from all directions. This style of microphone is unique as the microphone is actually in the videographer’s ear canals. This produces very realistic audio quality, as what is recorded is actually what is being naturally heard. The SP-TFB-2 has a frequency range of 20Hz to 20,000 Hz. Although the size and weight of the microphone is not published by Sound Professionals, they are similar in size and weight to earphones that are supplied with a Smartphone. However, the SP-TFB-2 does require an external battery pack as a power source, which adds to the size and weight of the standard setup. The microphone also features optional windshields to reduce wind noise to enhance audio quality. Since the microphone mounts in the user’s ears, there is no shock mount; however SP-TFB-2 microphone remains in the videographer’s ears easily even is action situations. Check out the latest prices and discounts here. * Information from the Sound Professionals and various other websites, including pricing. ** Price includes external battery pack. Anyone that records video with a GoPro camera should really look at one of these external microphones, as they will greatly improve the audio quality of the video recorded with any GoPro camera. Lightweight, compact and very affordable, these microphones are well worth the cost. Take a look at these external microphones and really step up your GoPro video game. You will be impressed with the results! GoPro Models Compared – Which is the Best GoPro for Me? 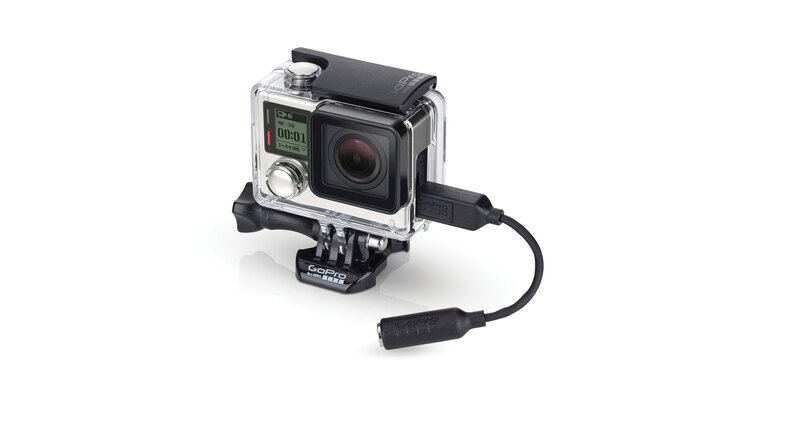 GoPro Hero 2 vs Hero 3 – Which GoPro is the Best Value?